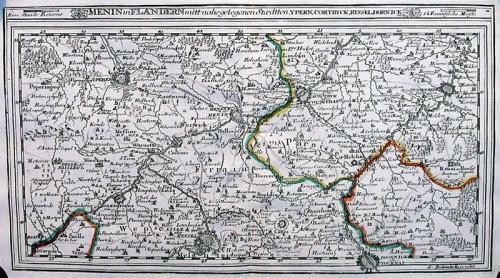 A very detailed 300 year old tourist map and guide of the region around Menen in Flanders. A network of roads link the towns and villages. The fortified towns of Ieper, Kortrijk, Oudenarde, Tournal and Lille are shown, as is the defensive fortification line from Kortrijk to the river Scheldt. Scarce. Fold(s) as given.